This is without a doubt the best gluten free cake recipe I have developed so far. Here’s the story behind the name. I wanted to make a gluten free cake for G. and had the idea of a cocoanut cake. I looked at a few recipes, then tried to adapt one from the Jean Pare Decadent Desserts cookbook. The first time I made this it smelled great, very cocoanutty, and rose beautifully. When I took it out of the oven I smiled and figured I had accomplished something. Then I happened to glance at the recipe and realized I had left out the sugar! So, undaunted by this mistake, I made a sugar syrup and soaked the cake before icing it. Overall, it was still a promising cake. The next time I made it I remembered the sugar, and it also came out fragrant and fluffy. Anyway, I have since made this cake 4 times, each time tweaking the recipe a little bit. You will groan at the number of flours I have used, so just substitute if you dont have all of them, but it might not be as good as mine then! The most recent version of this cake was for G’s birthday, and everyone had seconds. You really cannot tell this is a gluten free cake, it tastes like a moist, somewhat rich buttermilk cake. I decorated the birthday cake with Johnny Jump Ups fresh from the garden, but when the birthday boy blew out the candles they all blew off! The naked cake still tasted delicious. 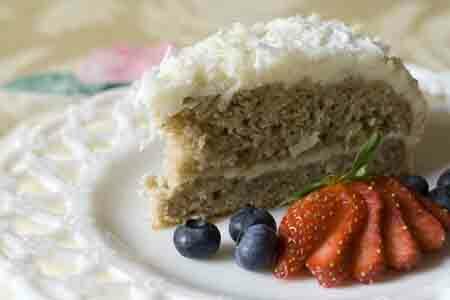 This cake is scrumptiously full of coconut. 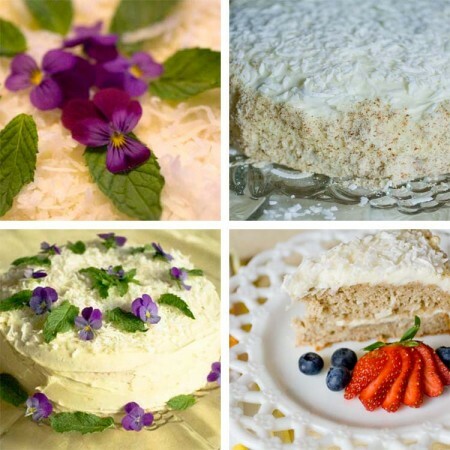 It is a substantial buttery cake that is ideal for a birthday or other special occasion. Use real buttermilk – no substitutes. The icing is very sweet. You can cover most of the cake with the recipe, if you want really thick icing double the recipe. 1/3 cup ground almonds Mix all dry ingredients together. I have tried variations on the flours, but this mix is the best. ½ cup sweetened flaked coconut Add the flour mixture and buttermilk in about three batches, Then stir the batter enough that there are no lumps. I do this all in the mixer. Fold in the cocoanut last. Bake in 2 – 8” round layer cake pans for about 20 – 30 minutes until lightly browned depending on your oven. When done check with toothpick. The cake will mound slightly in the middle and have a fairly firm texture. Spread thin layer on first cake, then top with flaked cocoanut. Stack next layer and ice the top. Do the sides if you have enough icing. 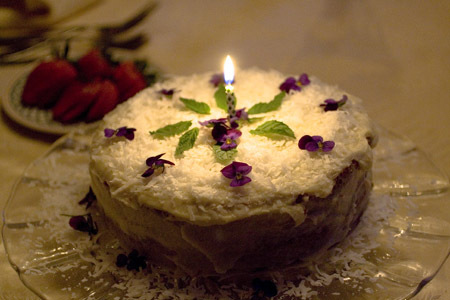 This entry was posted on Tuesday, June 22nd, 2010 at 8:24 pm	and is filed under Recipes, baking, gluten-free. You can follow any responses to this entry through the RSS 2.0 feed. Both comments and pings are currently closed.